It’s that time of year. Holiday music, sweet treats, classic movies — all the reasons to cozy up and spend time at home with the ones you love. And with Google Home, there are countless ways to spread the holiday cheer. Serve up the holiday classics that make your season bright, hands-free, right to your TV — when Google Home is paired with a Chromecast device. Now, in addition to YouTube videos, you can stream any movie or TV series from Netflix to the TV, using just your voice*. Start with “Ok Google, play Stranger Things from Netflix on my TV” or “Ok Google, play Love Actually on Netflix on my TV”. You can even control your media with commands like “Pause this episode”, without lifting a finger. Here’s how to link your Netflix account to the Google Assistant from the Google Home app (make sure you’re running the latest version). Netflix linking in the Google Home app is available now for iOS and rolling out to Android this week. Enjoy your Google Photos on the big screen, hands-free. The holidays is the perfect time to gather around and relive memories from the year. Google Photos now works with Google Home, so you can share your photos on your Chromecast-connected TV, using just your voice. Simply say, “Ok Google, show my photos of Lake Tahoe on my TV” to see your beautiful pictures bigger. Even if you can’t remember the name of the album, you can search for pictures. Try “Ok Google, show my photos of selfies at Christmas on my TV” or “Ok Google, show my photos of Brazil sunsets on Chromecast”. You can even use your voice to search for your places, things and people. Learn how to link your Photos account to the Google Assistant here. Fill your home with festive tunes from your favorite music apps like Google Play Music, Spotify, Pandora, or YouTube Music with just a simple voice command. Say, “Ok Google, play Hanukkah music” or “Ok Google, play Christmas music” and you’ll get into the spirit in no time. Keep the holiday glow going well into the new year as you enjoy a premium music experience — more songs, more versions, no ads — with YouTube Red. Get six months free of YouTube Red when you buy a Google Home before December 31, 2016**. 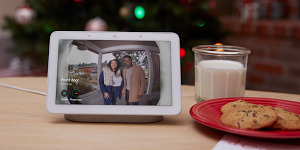 Make your holidays truly magical with Google Home. **Offer expires 12/31/16. Terms apply. New subscribers only.